I'm way behind in blog land and have so much to post, including my highlights from Design:Made:Trade and Decoration + Design (however long ago they were - its still too good not to share) But I am long overdue in sharing with you one of my biggest projects from 2012 - the Dulux Colour Forecast 2013 - Colour Movement. I have been working with Dulux as their resident colour expert since May last year, working with Andrea Lucena-Orr to develop the new colour forecast for 2013 and have been having an amazing (if not extremely busy) time. It's also very rewarding when you see large projects come to fruition and look as amazing as this one does. It was a privilege and a pleasure to see some of Australia's best tastemakers, Mim Design and Ella Leoncio interpreting the Dulux colour trends and bringing them to life with such beautiful imagery. Here's just a snippet but please jump over to the Dulux Colour Forecast page and take a look at the rest of their work. And don't be shy - let me know which trend you like most! Bright pops of colour ruled the show floor. Used with slick gloss surfaces in black or white or against the contrast of raw finishes such as paper and wood, colour was definitely there to emphasis the playfulness of design elements. Dominating was pink from bubblegum to magenta and yellow from citrine right through to orange. Its great to see the availability of more colour within product ranges allowing us to be more adventurous through colour. Plywood is the new black - its one of those everyday materials that has been embraced by designers for its gorgeous natural appearance and its Eco-friendly features - plus its super versatile. 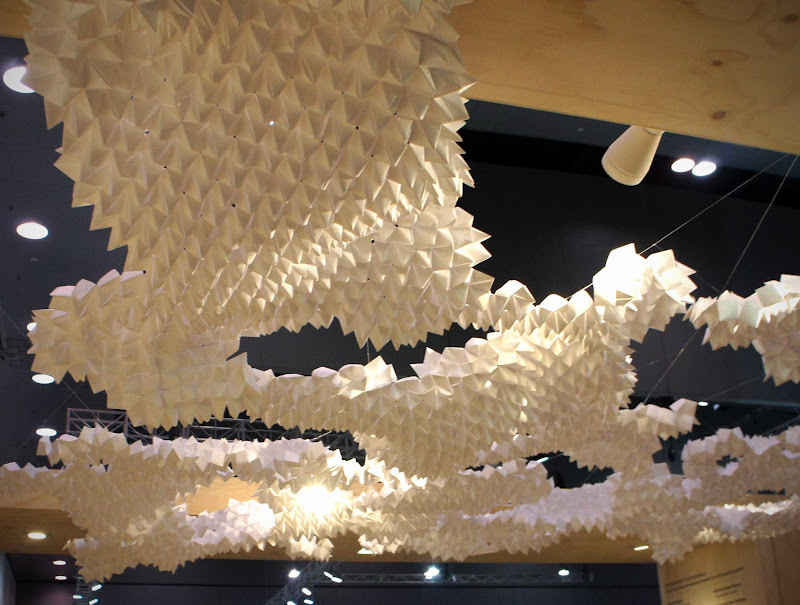 Paper too - no longer just for folds and pleats to create pretty installations [although that works too!] 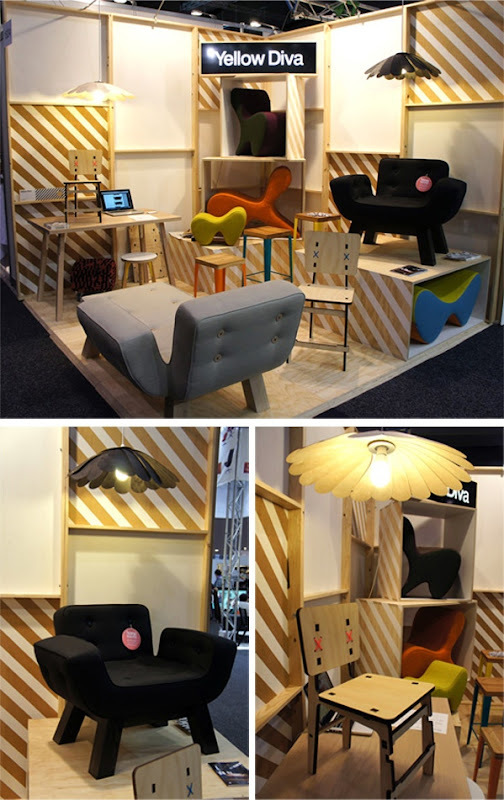 there's cardboard flat pack furniture that actually lasts so it doesn't have to be temporary.So much of this raw look is juxtaposed with luxury styling or product as was the case with the Format stand. 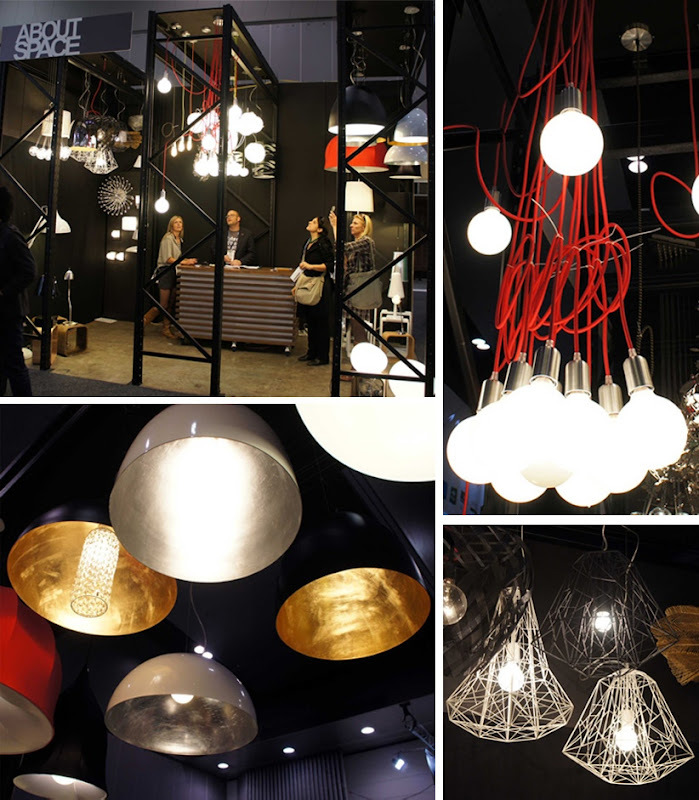 I loved the Plumen globe - it was featured on the Tork stand [unfortunately for Tork I was only interested in the light but I did think they had a pretty punchy stand!] with the phasing out of incandescent lighting it's so great to see design take the initiative to further develop simple products like the light bulb into something more. These energy saving bulbs are so great naked but also look great peeking out from pendants and desk lights. I actually thought the globes were all a bit different but its just that they look completely different from all angles so on mass they work fantastically. I haven't been able to find them in Australia but they are available pre-order at Plumen for $29.95 US. I seem to be drawn to this look at the moment - the wire or ribbed look - and this little bio-ethanol freestanding fire won me over. The EcoSmart ventless fireplaces are such a flexible idea, you can even convert an existing fireplace with an EcoSmart grate or firebox insert. 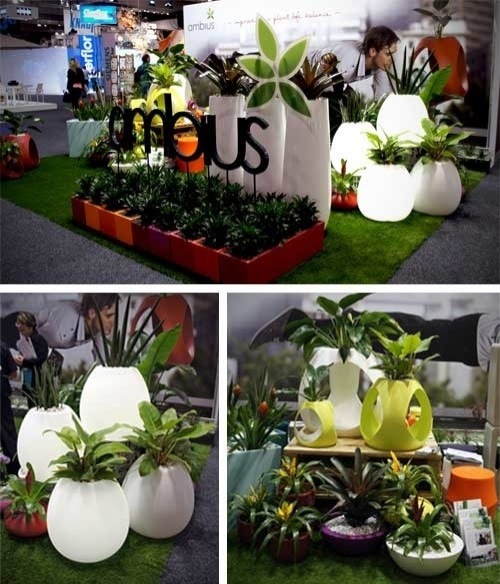 On the Ambius stand there was the fabulous Zoie planter- designed by Helen Kontouris - which is fully recyclable and comes in a gorgeous range of colours. I got a very retro vibe from this one. I also loved the Zoie illuminated planter that doubled as a light - this is due for release in a couple of weeks so check in with Ambius for further info on it. There was also Stax [I didn't get a good pic of Stax but I thought it looked fantastic] - stacking wall planters - great for gardens or indoors with limited space. These Screenwood linear timber panels can be used for ceiling, facade and wall, they look great and being pre-made makes them super easy to specify. I love them as a ceiling feature. Who's sick of the same old bathroom sinks? Ive been looking lately and they really are all pretty much the same. The Hatria range on show was just that little bit different - the curves were in all the right places. Hatria is a available from E & S trading. Later this week let's look at the trends aspect a bit. In the meantime - which product stood out for you? Yes, I know - you've been waiting for it - well its always better late then never [and I'm so thankful for that saying as it too often applies to me...] the DesignEx 2011 review. This year there were some small stands that caught my eye with their creative displays or quirky goods. About Space [above] - a small lighting and furniture store in Fitzroy Victoria - had a compact stand that was chock full of great lighting pieces. Right on trend were the industrial pendants with luxurious metallic interiors, the angular web like lines of the Lineare range and the Muuto inspired Cluster with their exposed bulbs and coloured cords. 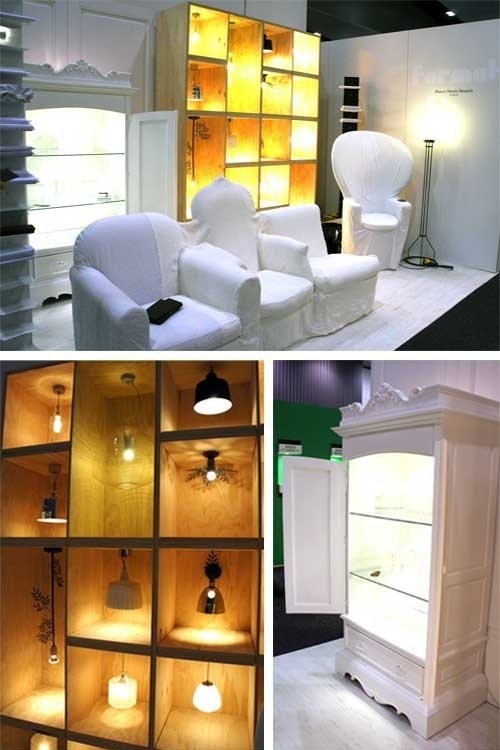 And how perfectly packaged was the Yellow Diva stand - compact but making a statement through their furniture pieces against a backdrop resembling the inside of large crate or perhaps an area under construction. Simple vignettes were created to draw your eye to their feature pieces. 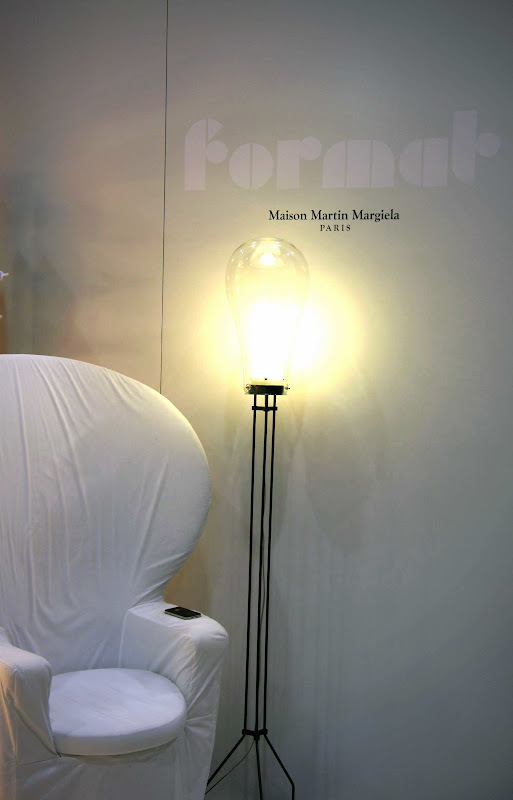 Format Furniture featured the eclectic Maison Martin Margiela Collection (a collection of objects and familiar furniture forms reinterpreted and united with white linen covers) keeping the stand fairly austere and letting the quirky furniture elements do the talking. I really liked the way they displayed the pendant lights - a good solution for something that can be difficult to effectively display on mass. I love a stand where the product does all the work - I think that's the case with the Ambius display. I loved the bulbous shape of the planters that also acted as a soft glow light - how fantastic for your outdoor entertaining area. 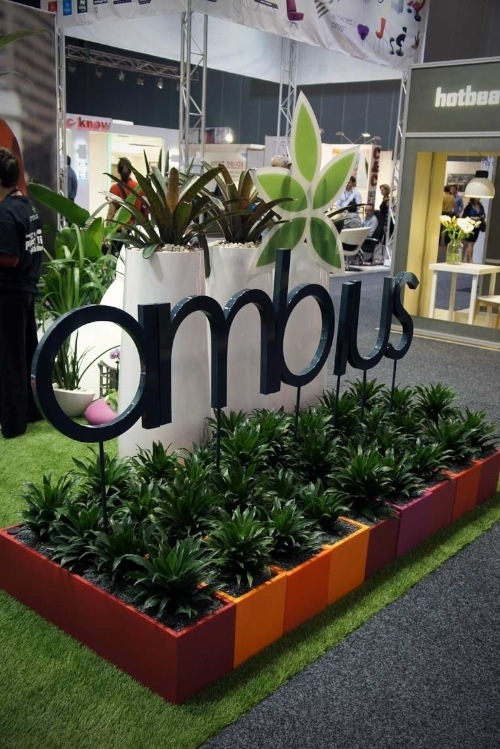 The Ambius stand had such a fresh look with great product display and bright popping colours. A lot of the large stands were very corporate looking and not particularly creative or inspiring. I think they really let their products down in that way, I know from experience that some serious money is spent on these events and it's wasted when you don't inspire or captivate the people attending the show - designers love to be wowed. 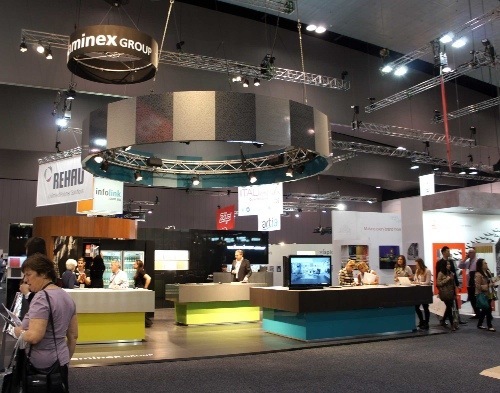 Even Laminex [above] was a little uninspiring - a stand I usually look forward to seeing at DesignEx, they seemed to opt for a very conservative approach this time around, I'm sure they had their reasons for doing so but I was disspointed. One large stand that I thought was done well was Ilve - they created the drama needed to get the attention of the exhibition visitors. 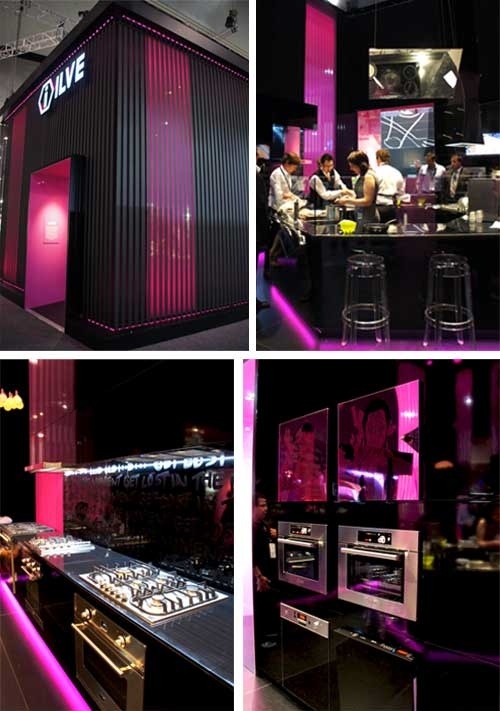 I loved the high gloss finish of the black against the magenta lighting and the follow through of the theme. Although the graffiti aspect is nothing new I still love that look [you can see it if you look closely at the splashback].